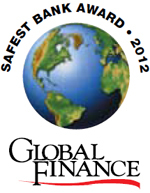 NEW YORK, August 16, 2012 — Global Finance magazine ( GF mag.com) has named the Safest Banks in Central & Eastern Europe in an exclusive survey to be published in the October 2012 issue. Winners were selected through an evaluation of long-term credit ratings—from Moody's, Standard & Poor's and Fitch—and total assets of the 500 largest banks worldwide. Czech banks take the top two spots on the list this year, but Polish banks dominate the list overall, with five banks in the top ten. The full report evaluates the safest banks in Western Europe, Central and Eastern Europe, Asia, the Middle East, North America, Latin America and Australasia. "More than ever, customers around the world are viewing long-term creditworthiness as the key feature of the banks with which they do business," says Joseph D. Giarraputo, publisher of Global Finance . "These banks have solid capital positions and superior risk management capabilities."